One from early in my career, some of the patented ideas in the platform were prescient enough to be infringed more than 10 years later by the leading mobile OS providers of today. The patents US Patent 8,434,020 and US Patent 8,713,476 and UK Patent GB 2635712 , on which I am the sole inventor, are currently in litigation in the UK and the US. The current owner of these patents, Conversant, successfully sued LG for damages in 2016 for infringement in their Android devices from 2012 onwards. I attended court to testify for Conversant in Marshall, Texas. The case is reported here on the patent owner's website and here in the legal press. iOS infringes these patents as well as Android and Conversant are litigating with Apple in the US and UK. The patents survived claims of invalidity, resulting in a precedential decision of the Federal Circuit in 2018 on what is eligible to patent with regard to graphical user interfaces. They have also been cited as examples of how to survive Alice analysis in the legal press. Pearl was a new breed of smartphone UX that left softkey-based interaction and the deep navigation hierarchies of the time behind and included many of the familiar features we see in smartphones today. These include an app list accessed via a dedicated button, a Back button in the top left, a narrow status bar uncluttered with icons, a simple app architecture and downloadable third party apps. Pearl introduced a Back button in the top left which Android and iOS subsequently adopted, the illusion of apps always being open, a flat navigation structure and the ability to view what's been going on in your apps and access key app functionality easily from anywhere - the subject of the patents. I led a small but very talented team in designing and specifying a completely new interaction model for smartphones in a ‘skunk works’ context. The brief was simply to come up with a new smartphone UX that Symbian could licence to device manufacturers. Immersing ourselves in the multitude of phone OSs that were available at the time and reverse engineering their design rationale as far as we could, we developed a deep understanding of the challenges we faced and the solutions others had provided to address them. Fortunately we did not have the ‘baggage’ that they had and were free to innovate as much as possible, in line with a strong company desire to develop IP for Symbian. It was the perfect opportunity to do something groundbreaking. We spent a couple of months of generating and testing ideas - sketching and storyboarding the main UX structure and detailed interaction concepts and guerrilla testing them with users. We operated a dual-track prototyping system using Director - one track for developing, communicating and testing ideas, the other track for integrating proven ideas into a fully functional simulation of the UX. The simulation served as a visual specification for developers as well as a tool for broader and deeper user testing and demonstration of the UX. We used it to demo the platform to the public at CEBIT 2001, to Symbian licensees and in user testing, including a version localised to Japanese to validate my hypothesis that the interaction model would work for the Japanese market. 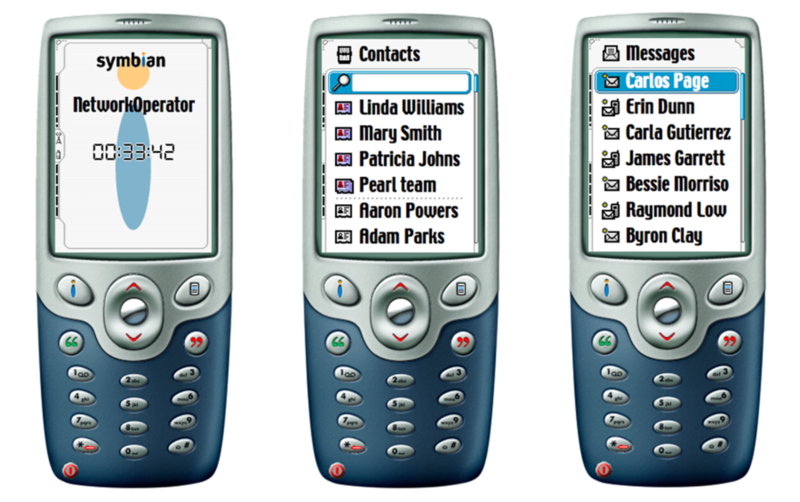 The OS and 8 apps were specified and were halfway through development when the project was cancelled as Nokia, the main shareholder in Symbian, wanted to reduce the competition for their Series 60 platform which they had decided to license to other manufacturers, essentially executing the Symbian strategy themselves. The press responded very well to the Pearl UX and it is discussed briefly on The Register. It looks old now - pixels were a lot bigger back then - but here fundamental interaction model is the same as what we use today. Here’s how it worked. and some key screens screenshotted from the Director simulation.